Art critic Paul Carey-Kent has given us his pick of the crop for the London Art Fair 2017. The verdict: “It seemed a little more even – and so a little duller – than usual this year”: less dire stuff, less outstanding material. 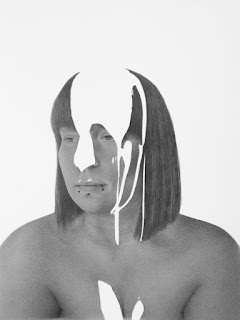 Here are a few things I feel moved to make awards to in reasonably pointless categories… More officially, Hannah Farrell (at PAPER, a good stand – see below as well) won the £2,500 De’Longhi Art Projects award for best artist in the Projects section. The London Art Fair, now in its 29th edition returns to the Business Design Centre in Islington, London from 18-22 January 2017. 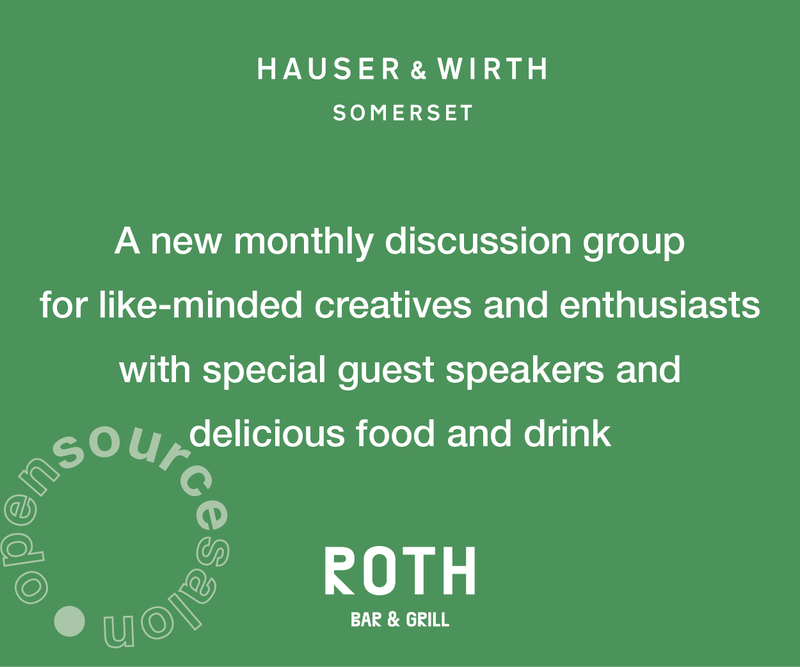 The Fair is well known for providing a supportive environment for collectors of all levels, enhanced by an engaging programme of curated exhibitions, talks, tours, films, and performances. With art spanning the early 20th century to the present day, London Art Fair 2017 sees 129 galleries present museum quality Modern British art alongside the very best international modern and contemporary art. Over one-fifth (22%) of this year’s exhibitors come from outside of the UK, with galleries from 18 different countries including China, France, Germany, South Korea and the USA. The Zimbabwean artist has found a personal voice at just 22, using his own recipe for silicone infused paint to weave / sculpt /paint semi-disintegrating lattices. They look like tasty abstractions where you might expect political engagement given Zimbabwe’s problems – but Makaza says his foundational shape is the animal hide, and its easy enough to read the works as disrupted maps, damaged viscera or post-traumatic remnants. Woking’s Lightbox, ten years on from its opening, is the special institutional guest. 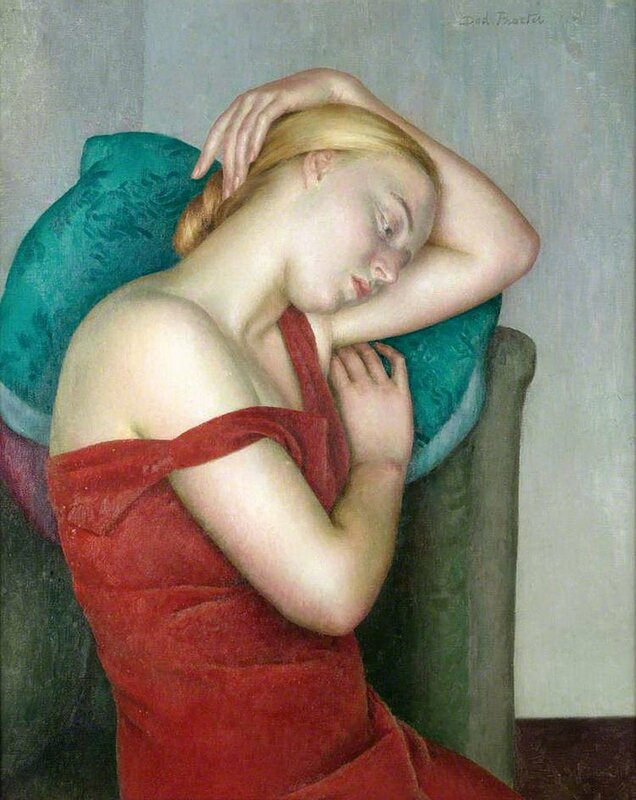 The stand’s impressive range of Modern British work from the Ingram Collection, included this from the underrated Dod Procter (1890-1972), who studied in Paris before settling in Newlyn in the 1920’s. Solidity and light come together atmospherically in her figures, the best known being Morning (1927), which is often on show at the Tate. The best sightline in the fair pairs Welsh-based Swiss Andreas Rüthi’s nine colourful fungi-scapes with Helen Sear’s Becher-tweaking set of twelve images of circular hay bales rendered strange by both the digital removal of shadows and their substitution for the camera’s lens in presenting landscapes. Nor is it just the works which get on together: the artists are a couple. 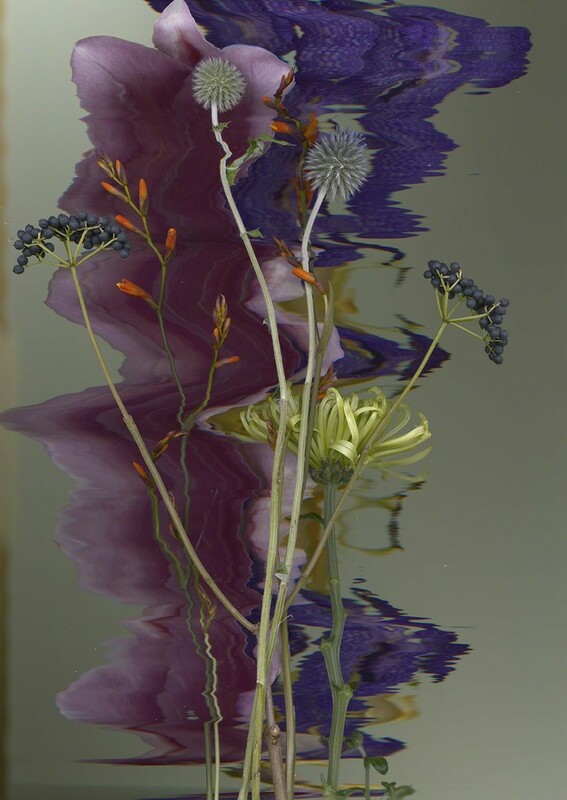 Finnish photographer Sandra Kantanen achieves painterly effects by distorting her images of the natural world. Her latest floral series essays a dragged effect in the tradition of Polke’s photocopy works or Gordon Cheung’s more recent computer glitching of Dutch Golden Age still life paintings. The result looks decidedly watery as if the flowers’ colours have been spread into hue-intensified reflections – and infect a dreamy beauty with a slightly alien undertow. 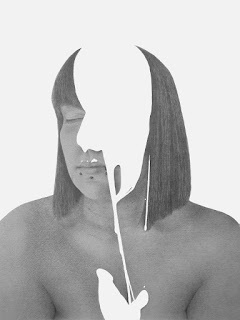 The artist-led Manchester gallery featured Bethan Hamilton’s sequence of herself being ‘sploshed’ by increasing amounts of yoghurt: technically assured drawings in which the pour was the simple negative of blank paper. I learned that sploshing – also known as the ‘Wet and Messy Fetish’ (WAM), is for people who are aroused by the copious application of such substances. Hamilton’s practice has often dealt with eating, so this fits at a slant to that, but can also act as a take on the painted self-portrait. John Hooper’s highly textured chequerboard abstractions emerge from a mixture of rules and intuition: the primary underlying pattern of colour application in the knight’s move from chess, but with exceptions, and the colours derive from his responses to the art he looks at (here August Macke is prominent) and the music he listens to (Benjamin Britten gets a mention), all of which is annotated by date down the side of the painting as he works on it. Beardsmore, incidentally, has joined London’s rent-driven trend towards galleries giving up their permanent space but continuing to operate (see also eg Art First, Jane England, INIVA). 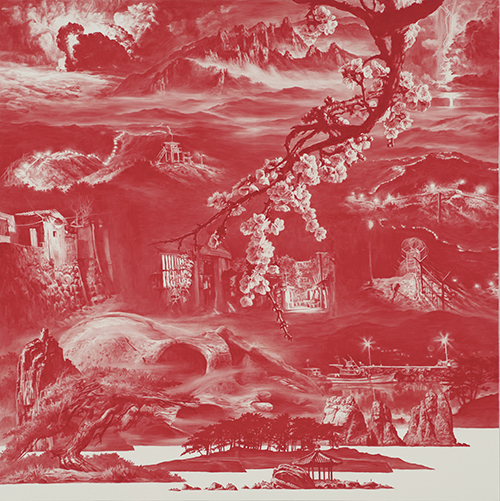 For some years now, Sea Hyun Lee has been painting red-on-white landscapes which collide the natural world with the sociopolitical complications of Korea, the monochrome originating in surveillance photography, the redness in the political and personal. This recent square format example (horizontal panoramas are more typical) poignantly juxtaposes blossom with the Sewol ferry disaster of April 2014, in which 304 people died. Film is rare at LAF. 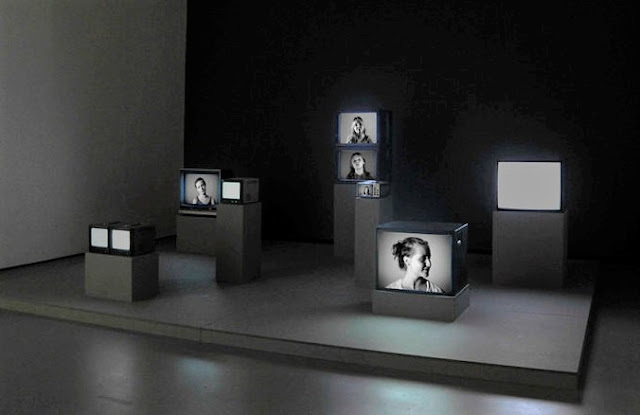 Chrstine Monarchi’s theme (in the generally reliable ‘Photo50’ curation) is adolescence, and the outstanding work is Melanie Manchot’s nine-channel installation, fading in and out the variously aged footage of her daughter, as filmed for one minute per month from 11-18. Given the constraint, it’s surprising how strongly the construction of selfhood comes across. Nathaniel Rackowe: Sign 2, 2017 at Parasol unit, London. Most of the work at LAF is suited to the wall – even the sculpture. That was true of Alice Anderson’s impressive display at Union Gallery, and of this elegant edition of three powder coated steel and timber units with fluorescent light. It calls itself a sign but signals nothing but its representativeness of Rackowe’s practice – which is to say, using light as a sculptural material which can push beyond the edge of the sculpture. I’ve often seen the odd mid-fifties blotted line cat made during his advertising drawing period by the known feline obsessive Andy Warhol. Yet I hadn’t really taken in the origin of the 19-strong set. 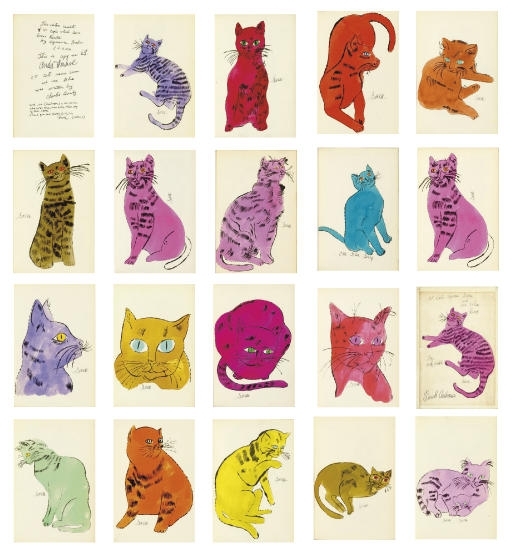 They are the illustrations (apparently six cats short) from a confusingly-titled privately printed artist’s book, with calligraphy by Warhol’s mother, Julia Warhola. 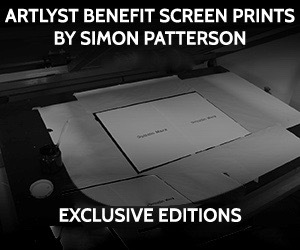 This complete version, from a print run of 198, is available for £110,000. Expensive for a chopped up book, or cheap for Warhol? 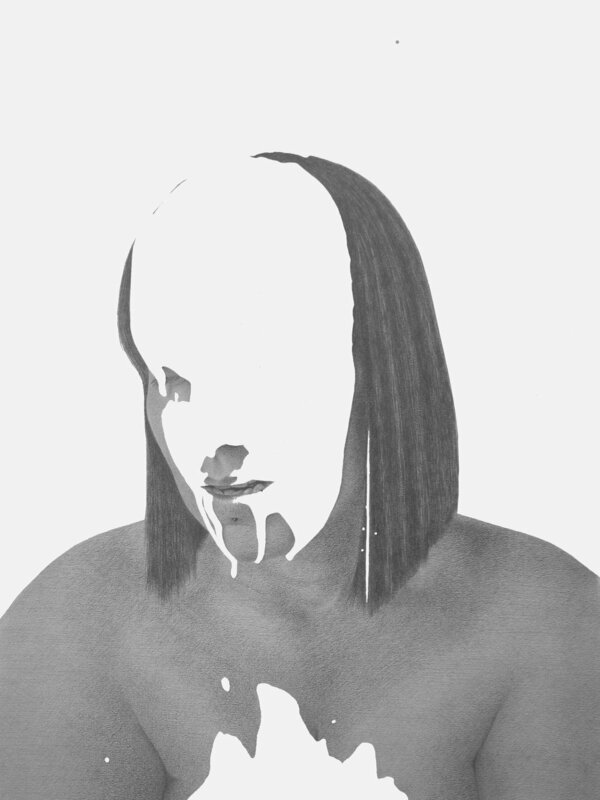 Marine Lewis was one of three less known female artists chosen by three more established ones at INIVA. 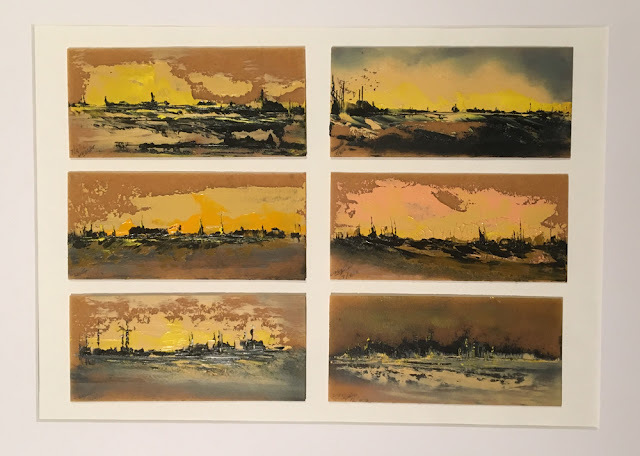 She sees her small ‘portal paintings’ as exit points from her inner world, the result being freeform but with a strong infusion of seascape which I’m happy to attribute to the sub-conscious effect of her unusual name. So why are they painted on uncooked sheets of lasagna? The answer may lie at a deeper level, but then again – why not?